India's homegrown car manufacturer, Maruti Suzuki India Limited has produced a wide range of vehicles in the automobile market. 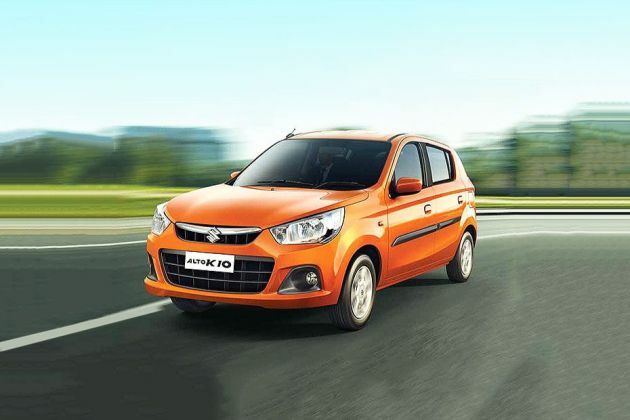 Maruti Alto K10 is one of its best selling hatchbacks, whose facelifted version is introduced in a few trim levels. Among these, Maruti Alto K10 LXI is a mid range variant that receives some modifications to its interiors as well as exteriors, while the technical specifications remain the same. It is incorporated with the same 1.0-litre petrol engine that produces 67.04bhp in combination with torque output of 90Nm. But, it can now produce a maximum fuel economy of 24.07 Kmpl, which is rather good. It has a stylish body design, which looks quite refreshing. The front fascia has a redesigned radiator grille that has a chrome plated strip. It also has a revamped bumper and a tweaked headlight cluster. This hatch is blessed with a roomy cabin that includes a three spoke power steering wheel, rectangular central AC vents and a new instrument cluster. Other standard features like sun visors, air conditioning unit and a few other comfort aspects are available. The suspension system is quite proficient, which helps it to maintain its stability at all times. This trim is loaded with some standard protective features that offers security to its occupants and the vehicle as well. It is currently offered in six attractive color options, which are Tango Orange, Cerulean Blue, Granite Grey, Superior White, Silky Silver and Fire Brick Red for the customers to select from. It has standard warranty of 24 months or 40,000 kilometers, whichever comes first. This period can be further extended to two years or 40,000 kilometers, whichever is earlier. This new hatchback receives minor updates to its exteriors, which enhances its outer appearance. It has an attractive body design and curvier structure that is equipped with many notable aspects. The front facade looks impressive with a tweaked radiator grille that is garnished with chrome. It also includes an insignia of the company in the center. This grille is flanked by a new sweptback designed headlight cluster that features high intensity headlamps and turn indicators as well. The body colored bumper is slightly tweaked and fitted with a wide air intake section that cools the engine in no time. There is a sleek bonnet and a wide windshield that is integrated with a pair of wipers. Coming to the side profile, it has door handles and driver side outside mirror. It has neatly carved wheel arches that are equipped with a set of 13 inch steel wheels. These are covered with radial tubeless tyres of size 155/65 R13 that provides a strong grip on roads. Its rear end has a decent look, which includes features like a body colored bumper and a jewel finished tail light cluster that gives it a modern look. It has a wide windscreen and an expressive boot lid on which, the company's emblem is neatly embossed. This vehicle is built with an overall length of 3545mm along with a total height of 1460mm. It has an overall width of 1490mm, which goes up to 1515mm with body side molding included. The wheelbase of 2360mm is quite good, while its ground clearance comes to 160mm. This Maruti Alto K10 LXI variant has a roomy cabin that is decorated with a dual tone color scheme. It can take in five people with ease and offers enough leg room to them. The dashboard looks simple and integrated with a three spoke steering wheel and a stylish center console. It also includes a glove box and an instrument cluster that displays a few notifications. There are well cushioned seats incorporated that have integrated headrests and these are covered with cloth based upholstery. There are some utility based aspects available as well like two cup holders in floor console, sun visor and a front cabin lamp. This variant is powered by a 1.0-litre, all aluminum light weight K10B petrol engine that is compliant with BS IV emission norms. It carries 3-cylinders, twelve valves and is integrated with a multi point fuel injection system. This motor displaces 998cc and is skillfully paired with a five speed manual transmission gear box. It is capable of delivering a peak power of 67.04bhp at 6000rpm. At the same time, it yields a maximum torque output of 90Nm at 3500rpm. This mill can produce a maximum mileage of around 24.07 Kmpl, when driven on bigger roads. Whereas it returns around 20 Kmpl in city traffic conditions. This vehicle can attain a top speed in the range of 135 to 145 Kmph and it can accelerate from 0 to 60 Kmph in close to 5.3 seconds, which is rather good. Its suspension system is quite proficient wherein, its front axle has gas filled McPherson strut, while the rear one is affixed with a three link rigid axle suspension. In terms of braking, its front wheels are fitted with a set of ventilated disc brakes and sturdy drum brakes are used for the rear ones. This variant is blessed with a power assisted steering wheel, which supports a minimum turning radius of 4.6 meters. There are a few interesting features available in this Maruti Alto K10 LXI trim, which helps in giving a comfortable driving experience. It is bestowed with an efficient air conditioning unit that helps in regulating the temperature inside. The front and rear seats are integrated with headrests, which adds to their convenience. In addition to these, it includes internally adjustable outside rear view mirror, dial type climate control as well as tail gate opener that further adds to the level of comfort. This mid range variant is loaded with some standard protective aspects that ensures security of the vehicle and its passengers as well. These include child safety locks for rear doors, high mount stop lamp as well as front and rear three point ELR (emergency locking retractor) seat belts that adds to the safety quotient. 1. Its engine returns a decent fuel economy. 2. Suspension mechanism is quite efficient. 1. It has very few comfort aspects. 2. Safety features can be improved.